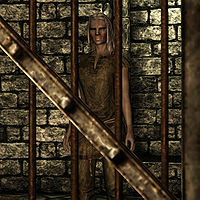 Bjartur is a Nord prisoner found in Castle Dour Dungeon in Solitude, apparently jailed for being a staunch supporter of the Stormcloaks. She wears a roughspun tunic and carries a belted tunic. Without anything to do inside her jail cell, her daily routine involves standing in one place, at times conversing with the patrolling jailor and headsman Ahtar through the bars. She sleeps from midnight to 8am. While you are in the dungeon during her waking hours, you will often hear her loudly exclaim "You won't get anything out of me, you filthy sons o' horkers." or "I stand with the Stormcloaks. You Imperial dogs will never break my will. Never!" If you attempt to talk to her through the bars she will defiantly say: "You here for my next interrogation? I got nothing but time...", "Leave me be, Imperial. I haven't got anything to say to you. ", "Don't think I don't know what's coming." and " It's only a matter of time before Ahtar's blade finds my neck..."
She will never get released, not even if the Stormcloaks take over Solitude. This issue has been addressed by version 1.3.2 of the Unofficial Skyrim Patch; she is disabled from the game. The game data suggests that she was intended to work at the Solitude Blacksmith. "Tell these Horkers to set me free." "Leave me be. I'm no harm here." Ahtar: "Rest up, scum. Probably getting executed tomorrow." Bjartur: "Yeah, you said that yesterday." "Guess the headsman's been busy with all your friends. Ha ha ha ha ha!" Bjartur: "Hey, jailor! What I don't understand is why you're siding with the Imperials." Bjartur: "I mean, the Redguards fought off the Aldmeri and the Empire, and now Hammerfell is an independent state. That's all we Nords want for Skyrim!" Ahtar: "I said shut up, scum!" Bjartur: "So it's okay if your people rebel against the Empire, but not mine?" Ahtar: "They aren't my "people." I'm with the Empire because they pay me. And that means I'm out here, and you're in there. So shut up, scum!"